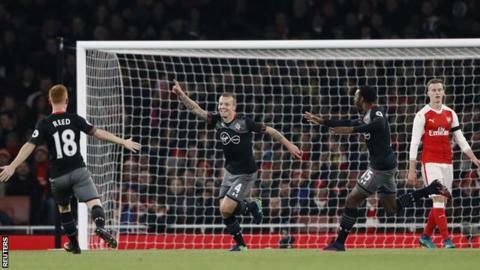 Southampton progressed to the semi-finals of the EFL Cup for the first time since 1987 thanks to a convincing victory over a below-par and under-strength Arsenal. Goals from Jordy Clasie - his first for the club - and Ryan Bertrand secured victory for a Southampton side which inflicted a first defeat on the Gunners since the opening day of the season. Manager Arsene Wenger, who has never won this competition during his 20-year reign in north London, had made 10 changes to the Arsenal team which beat Bournemouth 3-1 in the Premier League on Sunday and paid the price. In Aaron Ramsey, Alex Iwobi and Mohamed Elneny, the Gunners had Premier League regulars in their starting line-up - but without Alexis Sanchez, Theo Walcott, Olivier Giroud and Mesut Ozil, they lacked guile and bite. Southampton, who had only won once in their last 23 visits to Arsenal, deserved the victory and will play Liverpool in the two-legged semi-finals, with the first leg at St Mary's in the week commencing 9 January. During his tenure as Arsenal manager, Wenger has regularly used this tournament to give games to those on the fringes of the first team. That perhaps explains why they have won only one of their last six quarter-finals in the competition. The majority of Wednesday's starting line-up had defeated Nottingham Forest and Reading this season, but Southampton were a different prospect - a Premier League side with a game plan and nous. Arsenal's £17m summer signing Lucas Perez started for the first time since the 2-0 win over Reading on 25 October, but was a peripheral figure as he and his team-mates lacked energy and urgency, especially in the first half. Before the match, Wenger had said he hoped the victory over Bournemouth, which came following three successive league draws, would make his team more relaxed. But while the Gunners marginally improved after the break - the introduction of Alex Oxlade-Chamberlain adding pace - they rarely threatened. A long-distance strike from Ramsey and a second-half chance, which fell to Oxlade-Chamberlain, was as good as it got for them. Southampton had also made changes for this match, with only three of the starting XI which beat Everton in the league at the weekend starting at Emirates Stadium. But the ever-present Virgil van Dijk provided a solid platform for the Saints in defence, and the changes in personnel did not affect the visitors who were by far the better team. Clasie gave Southampton an early lead, leaving goalkeeper Emiliano Martinez with no chance as the Dutchman struck first time from long range in what was the match's first effort on target. The Saints soon doubled their advantage, again from distance. Carl Jenkinson lost possession in his own half and the visitors pounced, with Steven Davis and Sofiane Boufal combining to set up Bertrand for a first-time shot from the edge of the box. Southampton could have scored a third, with Boufal and Pierre-Emile Hojbjerg going close, but so comfortable were the visitors that they never seemed in need of another goal. Arsenal manager Arsene Wenger: "I regret that we lost the game. We had played well until now. If you look at the players who played well, some of those who did not play were on the edge. "In midfield we had Coquelin, Ramsey, Elneny, Xhaka, Perez... Giroud was injured. We had Iwobi, one of the regular players in the first team. "The problem wasn't there. We had players who are used to top-level competition. But we didn't have the right urgency. "I'm disappointed. We had a disappointing performance, particularly in the first half." Southampton boss Claude Puel: "It was a great performance because this game was a different profile. We were clinical in the first half, with two goals from two chances. I like this. "After, in the second half, we had many chances to score another goal and make the game safe against a good team. "It was a fantastic game to achieve that result: good solidarity, good attitude. I enjoyed what my players did." Southampton, 10th in the table, will attempt to extend their unbeaten Premier League run to three games when they face struggling Crystal Palace on Saturday - the same day that Arsenal travel to West Ham for what could be a tough London derby. Match ends, Arsenal 0, Southampton 2. Second Half ends, Arsenal 0, Southampton 2. Attempt missed. Kieran Gibbs (Arsenal) left footed shot from outside the box is too high following a corner. Corner, Arsenal. Conceded by Sam McQueen. Attempt blocked. Francis Coquelin (Arsenal) right footed shot from the right side of the box is blocked. Assisted by Granit Xhaka. Corner, Arsenal. Conceded by Maya Yoshida. Foul by Lucas Pérez (Arsenal). Attempt saved. Pierre-Emile Højbjerg (Southampton) right footed shot from the left side of the box is saved in the bottom left corner. Attempt missed. Aaron Ramsey (Arsenal) right footed shot from outside the box misses to the right. Assisted by Francis Coquelin. Attempt blocked. Sam McQueen (Southampton) right footed shot from very close range is blocked. Assisted by Josh Sims. Corner, Arsenal. Conceded by Cuco Martina. Corner, Southampton. Conceded by Emiliano Martinez. Attempt missed. Josh Sims (Southampton) right footed shot from outside the box is close, but misses to the right. Assisted by Sam McQueen. Attempt saved. Alex Iwobi (Arsenal) right footed shot from outside the box is saved in the centre of the goal. Assisted by Kieran Gibbs. Corner, Arsenal. Conceded by Ryan Bertrand. Corner, Arsenal. Conceded by Shane Long. Attempt missed. Kieran Gibbs (Arsenal) left footed shot from outside the box misses to the right. Assisted by Alex Oxlade-Chamberlain following a corner. Corner, Arsenal. Conceded by Jordy Clasie. Lucas Pérez (Arsenal) is shown the yellow card. Attempt missed. Alex Oxlade-Chamberlain (Arsenal) right footed shot from the centre of the box is too high. Assisted by Granit Xhaka. Attempt missed. Shane Long (Southampton) left footed shot from outside the box is close, but misses to the left. Assisted by Steven Davis with a through ball. Attempt missed. Steven Davis (Southampton) right footed shot from the centre of the box is just a bit too high. Assisted by Sam McQueen with a cross. Attempt blocked. Aaron Ramsey (Arsenal) right footed shot from the right side of the box is blocked. Attempt missed. Aaron Ramsey (Arsenal) right footed shot from outside the box is close, but misses to the right. Assisted by Granit Xhaka. Offside, Southampton. Jordy Clasie tries a through ball, but Maya Yoshida is caught offside. Corner, Southampton. Conceded by Gabriel.